Parellada Vinegar for sale. Buy online at Zingerman's Mail Order. Gourmet Gifts. Food Gifts. 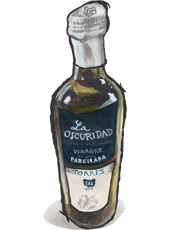 A beautiful white wine vinegar from one of Spain's most famous vintners. It should be no surprise that wine makers also make vinegar. After all, vinegar is just wine that's gone bad. Of course that's a simplified version of what's going on here...and 'bad wine' doesn't make 'good vinegar.' You still have to start with great wine if you want to make a great vinegar and that's what we have here: a flavorful, straightforward white wine vinegar made from exceptional Parellada white wine. Parellada grapes are native to Catalonia. They're a white grape and one of the main grapes used to make Cava (Spain's sparkling wine). Usually they tend towards the dry side of the spectrum, but they can be sweet too. The grapes in this vinegar tend more towards the sweeter side, in my opinion, because the vinegar has a sweet crispness that I associate with that style of wine. It has an apple-y and berry type of fruitiness with some woody, toasty notes. Those flavors come from the twelve years of aging the vinegar receives in oak casks. It's great for marinades and especially vinaigrettes. This time of year I like to use it to saute bitter greens like kale or collards and serve with grilled vegetables.